When I come to you with my heartache and sorrow, can you just listen, really listen? Can you listen without the need to judge me, with out the need to correct me, without the need to tell me what to do, without the need to protect me or save me from myself? When I tell you my pain can you not tell me all the ways I am not seeing this correctly, can you not tell me that I am acting like a teenager, can you not tell me that I’m worrying way too much about this? Can you not tell me what I need to do or say? Could you just listen for as long as it takes? Can you listen until I find my way? Can you listen until I unwind into my own knowing? Can you just listen because I have something I need to share and express? Can you listen and allow me my process? Can you listen just for listening sake? Can you listen with compassion? Can you listen with understanding? Can you understand everyone has something they are working through and even if you know all the answers, even if you think you know everything I am doing wrong, even if you think I should be over this by now, can you just listen? Can you listen and know that I just need to talk. I don’t need you to tell me what to do. I don’t need you to tell me what to say. I don’t need you to protect me from myself. I don’t need you to educate me about everything I am doing wrong. I don’t need you to tell me how ridiculous I am being. I need you to love me and I need you to listen. When you really listen without the need to protect, judge, rescue, save or set straight, when you really listen just for the sake of listening, you give other people the relief of sharing what is going on for them. You give them the opportunity to find their own answers. When you listen you allow others to have their process. When you listen without judgement or thought about how they should navigate their life you allow them space to come to their own knowing and step into their own power. When you listen just for the sake of listening you offer the deepest healing of all. And so for today practice listening. Hold back on advice giving. Hold back on judging. Hold back on thinking you know. Just listen. Just listen and send love and trust that the people in your life will find their own way, in there own time. Listen and love. This is all that is asked of you for today. Of course, there are times when advice giving is sometimes appropriate and even life saving. But it is only through deep listening that we will know when it is time to speak up. For today, focusing on listening. See how deeply you can listen and when you feel you want to advise, judge, correct, set straight or tell someone how absurd they are being, listen even deeper. Make listening your utmost priority for today and let any words you speak come from this place of deep listening. Your deep listening will allow others to unwind into their own answers. Listen deeply today and offer someone something that is a rare and special gift: your time, your attention and your love. Listen deeply today and give others the space to share what is truly going on for them. In this way, you will be a healing force in their world in a way that you can not fully fathom. Be a safe harbor for those in your life. Give the greatest gift of all. Learn to listen. P.S. As always, I write about what I most need to learn. And in that vein, I will be working on listening on a whole new level in 2019. Thank you for listening to my words. I deeply appreciate your time and attention. p.s.s. Our next Group Healing in Amherst, Ma. will be Monday, January 14th at 7 p.m. We are located at 800 Main Street, Amherst, Ma. middle door in the front of the building. Our healing community and healing power is growing. Feel free to join us for this evening of light, love, healing, community and laughter. We look forward to seeing you soon! I was sitting in my meditation this morning and while I was sitting an insecurity came over me. I was flooded with the feeling of not being good enough and wanting to run from a situation I was being guided toward. The urge to run was so strong but so was the urge to move towards. Anyway, I sat in my meditation feeling somewhat tortured by my conflicting emotions when I heard a voice whisper: You are a gift. You have something valuable to offer to this situation. You are a gift. Stop holding back. You are a gift. And this of course, this reminded me of a story. About 20 years ago I attended a Tony Robbins workshop. During the workshop Tony would periodically have us pair up with a partner to discuss what we were learning and experiencing. There was an uneven number of people in my row and so I found myself pairing up with a man a few rows back. He would come and sit next to me during the partner time of the workshop and then return to his original seat when the discussion was complete. During one of our conversations I felt really drawn to invite him just to sit next to me through out the workshop so that he didn’t have to keep moving seats. The impulse to ask him to move seats was really strong but I held back. I was afraid of giving him the wrong idea. I was afraid of imposing my will. I was concerned he wouldn’t want to move seats, etc… etc.. And so, I squashed the small voice within that said: Ask him to sit next to you. The day continued on and still the voice within me persisted and began to get louder: Ask him to sit next to you, it demanded. Why would he want to sit next to me anyway? He is happy where he is. “Ask him to sit next to you” the voice persisted. No, I am shy. I don’t want to ask him to sit next to me. I don’t want to impose on him. He seems happy where he is. The voice at this point got so loud, that I actually couldn’t ignore it or fight it anymore. It was so loud that I could barely even concentrate during my paired discussions with this guy. Hey, I said to the man whose name I could not even remember. Why don’t you move your seat and sit next to me so that you don’t have to keep moving around. Sure, he said. Great idea. Anyway, he moved his seat and sat next to me. Shortly after Tony had us turn to the person sitting next to us and give them a shoulder massage (This was something Tony had us do periodically through out the day. And, btw, I was a massage therapist, so this was my specialty). Had I not asked this man to move seats he would not have been sitting beside me for this exercise. I gave this man a short shoulder massage and then he started to cry. During our next partner interaction he confided in me that he had grown up in an abusive household and had never in his life had nurturing touch or massage and was very shy about physical touch. He had been sitting alone before I asked him to sit next to me (which I hadn’t realized) and so no one had given him a massage yet during the day long workshop. He said me giving him that short massage was incredibly meaningful for him and had helped him to break through a lifetime blockage of letting other people touch him. I sat somewhat stunned by the story. No wonder the voice in my head was so insistent. No wonder I needed to ask this man to sit next to me. And to think I almost missed this opportunity to contribute to his life in this way because I was feeling insecure. I heard the voice whisper to me again and this time it said: You are a gift. Value yourself. You are a gift. Stop holding back. You are a gift. You are a gift. You are a gift. How often do we hold back our gifts to the world because we are not valuing ourselves enough? How often do our insecurities prevent us from helping another or stepping into our full potential or following our own flow and guidance? How can we value ourselves more and remember the truth of who we are? How can we stop holding ourselves back and step into our full contribution, our full service, and our fullest version of ourselves? I think we have to start by seeing ourselves as a gift. No matter how flawed we may be. No matter how many weaknesses and insecurities we may have. We all have gifts to offer this world. I had no idea that following my intuition and guidance that day would be so important. I had no idea that massaging his shoulders would be one of the turning point of his life. I shutter to think what would have happened had I not listened to my inner guidance, had I been too shy or hesitant to ask this guy to move his seat. I continued to sit next to this man throughout the day. We continued to share our experiences and even did a second massage exchange. At the end of the day we hugged and he thanked me for asking him to sit next to me and for helping him to break out of his fear of people and touch and isolation. We hugged and went our separate ways. I gave him my gift of compassion and nurturing touch and he reminded me that I am a gift and to stop holding back. Our work together was done and we both went back into our lives a little stronger. Perhaps he was the whole reason I attended that workshop to begin with. The world needs your full contribution. What will they think? What will they say? Will I be rejected? Stop thinking so much about yourself and how you will be perceived and start thinking about how you can contribute to the lives of others. Start thinking about how you can listen more deeply and follow your deepest guidance. Start thinking about the fact that you are a gift and have gifts to offer this world. Stop indulging in insecurities and value yourself and offer that which you came to offer. I have gifts to offer this world. I hold back no longer. I take my foot off the brake. Show me where I am needed. Remove my insecurities and fill me with the awareness that I am a gift so that I can offer what I’ve come to offer. I am the humble servant. I am the here to serve. I am filled with greatness. I offer my full contribution. Everything you want is right outside of your comfort zone. 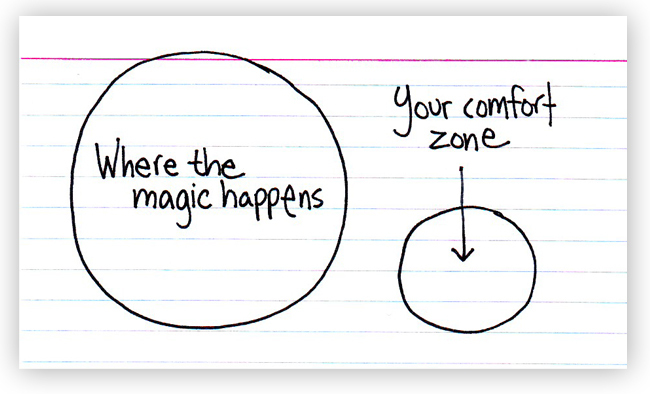 I saw a postcard the other day that said: Everything you want is right outside of your comfort zone. I’m not sure if this is entirely true, but for the most part, the postcard had a good point. As I looked at this card, I couldn’t help but reflect on a time in high school when I wanted to ask a boy to the prom. I had had a secret crush on this boy since I was 13 years old. I was too shy at 13 to say anything to him. The years went by and we were in different classes and had very little contact. When I was a junior in high school I was floundering hopelessly in advanced French and switched in desperation into a remedial French class. And there, in that class, much to my surprise, was the boy I had liked since I was 13 years old. I was seated right next to him. He and I became fast friends often talking before, after, and sometimes, during class. Even though we were clearly friends, I still sensed that he was somewhat oblivious about my feelings toward him. Somewhere towards the middle of the year, I had a knowing that I wanted to ask him to our high school prom. This was definitely, without a doubt, outside of my comfort zone. This wasn’t something the girl did. What if he rejected me? Does he even like me at all? Am I making a fool of myself? All of these thoughts swirled through my head. I still remember sitting by my phone with his phone number in my hand. I sat by the phone for two hours mustering up the courage to call him. I remember that I cried and didn’t think I could do it. I didn’t have friends I could talk to about this at the time and didn’t feel comfortable getting advice from family. So I sat on the floor in my bedroom and cried. Everything I wanted was indeed outside of my comfort zone. I wave of relief washed over me. Not so much because I got what I wanted, but rather because I had faced my fear and took action. If I remember correctly, I got off the phone and cried some more. Two weeks later this boy called me asked me if I wanted to go out to dinner. We went out to dinner and thus began our three-year (very meaningful) relationship. Everything you want is right out side of your comfort zone. These days as I think about some of my next steps in life, I once again feel some of the fears that I felt at 17 years old. Old fears and even terrors come to the surface. I even thought to myself the other day, I can’t do this. I can’t do the things that I’m being asked to do. Fear and parallels overtook me. In that moment, I did what I often do in these sorts of moments and I sat down and did a meditation. In that meditation a very simple phrase came into my head. The phrase was: I can do this. As I sat in the stillness, as I sat in the fear and the feeling I can’t do this, somewhere from deep within a voice echoed: I can do this. I can do this. The smaller me said, oh, yes, I remember now, I can do this. I forgot, I could. And slowly, the feelings began to evolve and change. I quiet confidence and power began to arise in me and I began to grow a little stronger. Now I would like to tell you that this is where the story ended and that I lived happily ever after never to face this particular fear again. But alas, that is not so. I came out of the meditation stronger, only to forget the very next day all that I had just remembered. (Reprogramming our mind and bodies is a process for sure). And so, I sat in mediation the next day. The fear arose again and once again I heard the voice say: You can do this. You can do this. Oh yes, I forgot. I can do this. I can do this. I love you and I can do this. And so it is a process, of stepping into our confidence and our power. Some days it comes naturally and some days we have to dig deep. Some days we feel like we are failing but even still we are moving closer to finding our strength and our confidence and our knowing that we can do that which is ours to do. Everything we want is indeed right outside of our comfort zone. If this is the case then we are going to have to dig deep, find our confidence and wisdom, find our courage, send lots of love to ourselves and when the time comes to jump, we will need to jump. We may still find ourselves crying on the bedroom floor sometimes but still, even so, if you listen deep enough, you will find there is a quiet voice within whispering to you. It is saying: You can do this. You can do this. It’s going to be okay. You can do this. Have a good weekend everybody. And if you liked this post and want to join with others who are working on overcoming there fears and stepping into a more empowered version of themselves please feel free to join our next group healing on Monday May 21rd or our weekly Thursday night meditation class. Both groups start at 7 p.m. and our drop in. It was the evening before Thanksgiving and I was tucking my 11 year old niece into bed. I was giving her a back rub (part of our night time tradition) to help her unwind from the days events. While I was massaging her back she turned to me and said: I told a boy I liked him today. I paused, somewhat surprised by her late night admission and said: “oh, I didn’t know that you liked a boy, What is his name?” She replied, and then I asked with genuine curiousity: What did he say? He said he would let me know on Monday, she replied again. Now I wasn’t sure what exactly he was going to let her know on Monday but I decided to let that go and continue with my line of questioning. Will you be okay, no matter what he says on Monday? I’m just glad to get it out of my head, she added. About two weeks, she said. After she drifted off to sleep, I couldn’t help but reflect on our conversation. I knew exactly what she meant when she said she was just glad to get it out of her head. I have found that when I don’t express something that genuinely needs to be expressed it can get stuck in my head and start to go round and round creating all kinds of havoc. I was genuinely so inspired by my niece’s bravery and boldness and her knowing that she needed to express. In chakra language: the throat chakra is the center of healthy expression. It is also the center for growth and learning. When we hold back our natural expression, things stagnate and growth and learning slow down. When we express in a genuine and attuned way the energy moves, situations in our lives evolve (one way or the other) and we naturally grow and learn. Healthy expression helps move the energy in our bodies and in our lives. But, one thing I do know for sure, is that my niece slept well that night because she said what she needed to say and had surrendered the outcome. She got it out of her head and was at peace. Often times there is something in our lives that we desire such as greater financial abundance or greater love. But, deep down inside of ourselves we feel we don’t deserve that which we are seeking. This feeling of not deserving or not being good enough creates a scism in our bodies and mind where we have our foot on the gas and we have our other foot on the brake all at the same time. Years go by and we wonder why we feel so stuck. It can be helpful when you find yourself in such a pattern to work deeply on self love, self forgiveness and feeling worthy to receive. So often the places in our lives where we feel stuck come down to a self love issue. It can be helpful to ask ourselves what might change in our lives if we loved ourselves more? What might we do differently? Would we speak up more? Would we speak up less? Would we be kinder and more forgiving towards ourselves? What blockages in our bodies and minds and life would be released if we truly forgave ourselves and felt worthy to receive? We work frequently with this issue in our meditation classes and group healings and I thought I’d share a brief meditation/affirmation on the topic with all of you. I offer myself love and kindness. I accept that I am human and have made mistakes. I allow myself to go from one imperfect activity to the next. I offer myself love and compassion. I am spirit and I am learning. We are all spirit and we are all learning. The earth is a school and we have all come for learning and growth. Stop being so hard on yourself. Learn to offer yourself love and forgiveness and tolerance and acceptance as you go from one imperfect activity to the next. Do not strive for perfect. Strive for continued growth and learning. Allow yourself to be a student of life and in so doing you will become a teacher. Allow yourself to be filled with humility and in so doing you will step into your greatness. Step into your greatness now and offer yourself love and compassion. What might heal in your body if you truly loved and forgave yourself? What might heal in your life if you fully felt worthy to receive. I am good and I deserve goodness. I am good and I am worthy to receive. I feel so worthy to receive. I am open to receive goodness. I am open to receive abundance. I am open to receive joy and freedom. I am open to receive healing and wholeness. I am open to receive all that life wants to bring to me now. I stop the self punishment. I instead offer myself the love and compassion I desire from others and in so doing become a beacon of light and love for all. I see my goodness and I know that I deserve goodness. I am growing in my capacity to love myself. I am growing in my capacity to forgive myself. I am growing in my capacity to open to receive. I am open to goodness. I am open to assistance. I am open to all that life wants to bring into my world. So let this be your experiment for the day and the week. How open can you be to receive? How much can you love yourself? How much genuine forgiveness can you cultivate for yourself and others? Take your foot off the brake. Let go of the past and step into the life that awaits you now. Shower yourself with love and kindness and be aware of how this affects your body, your mind, the quality of your day and your life. If you found this mediation/affirmation helpful and you live in the Amherst area, feel free to join us for our Tong Ren Chakra Balancing group on Monday nights at 7 p.m. or our Meditation class on Thursday nights at 7 p.m.
Email me or click here for more information. Take a moment now and allow the vibration of the words to awaken your confidence, power, beauty and radiance. Feel your confidence. Feel your power. Embody beauty and radiance now. I embody beauty and radiance. I embody these things and I develop an I can do this attitude. I can do what I ‘ve come here to do. I can learn what I’ve come here to learn. I can achieve what I’ve come here to achieve. Stand in your power now. Stand in your rememberance of who you are. You can do what you’ve come here to do. You can learn what you’ve come here to learn. You can achieve what you’ve come here to achieve. With spirits help you can do this. So often we wait until the external conditions of our world are the way we want them to be in order to feel confident or powerful. What would it be like to connect to our power and our confidence and then see how life begins to show up differently. Let this be your experiement for this day and this week. Embody the attitudes that you wish to feel. Embody the attitudes that you are waiting for the external world to give you permission to feel. Feel the feelings first and then be aware of what shows up differently in your life. I develop an I can do this attitude.